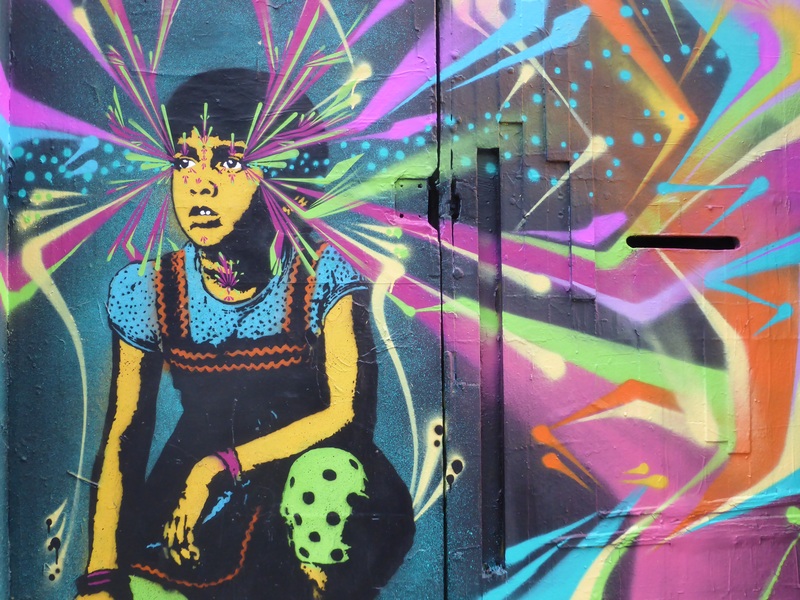 Today we have finally got together and made our free Street Art walk of Brick Lane, the epicentre of East London’s Street Art scene. 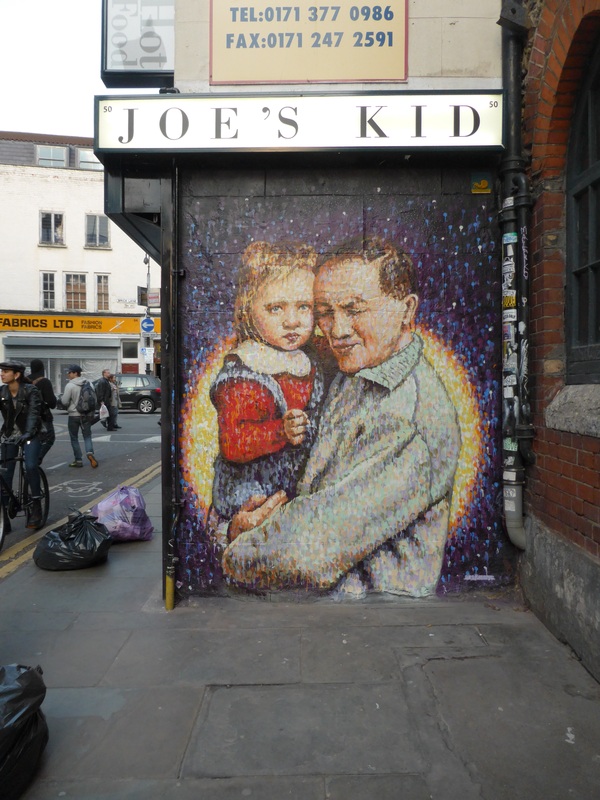 Brick Lane has had many incarnations and seen many communities come and go, calling this place home. Winding through fields, the street was initially Whitechapel Lane and derives its current name from the brick and tile manufacturing started in the area in the 15th century. By the 17th Century brewing came to Brick Lane with Benjamin Truman establishing the sizeable Black Eagle Brewery on Brick Lane. Alongside this the earliest incarnation of the still thriving Brick Lane Market developed for fruit and vegetables sold outside the City. Through this time successive waves of immigrants settled in the area: in the 17th century, French Huguenots expanded into the area, escaping religious persecution in France. At this point the Spitalfields area became a centre for weaving, tailoring and the developing clothing industry. In the 19th century, Irish and Ashkenzai Jews immigrated to the area and today Brick Lane is the heart of the city’s Bangladeshi-Sytheti community earning the area the name of Banglatown. Alongside this in recent years Brick Lane has grown to become the hub of Street Art in London, which is what this walk is focused on, but be sure there is a lot of history from the last three to four centuries to be seen on the Streets, including the London Jamme Masjid built on the corner of Brick Lane and Fournier Street. Before this the Mosque was Spitalfields Great Synagogue and a Methodist Chapel before that, you can see the Huguenot sundial in Fournier Street. You can also see where a victim of Jack The Ripper was found and the Victorian cobbled paving in that spot and finally be sure to check out the bright and intriguing Huguenot housing from the 1700s in Princelet Street, it really is like walking through a time warp in the a London lost. 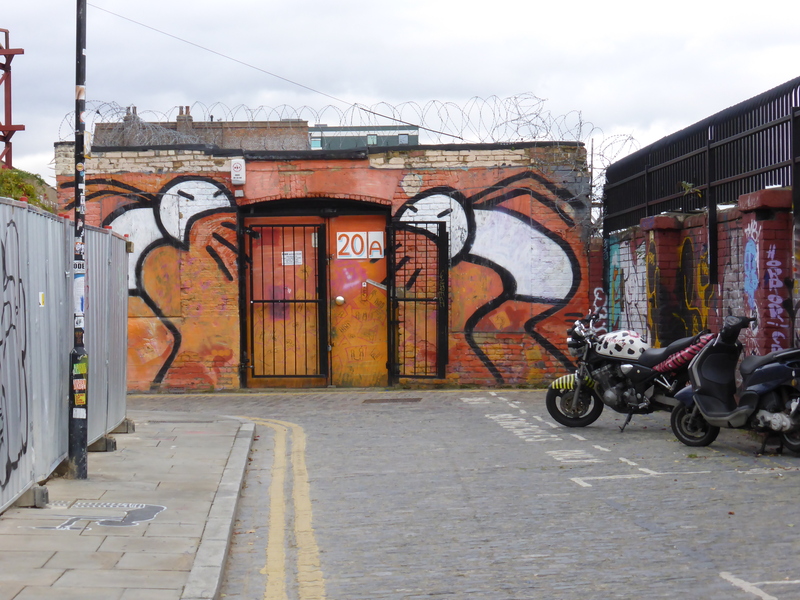 The walk should take you some two hours, depending on how much time you stop to admire the artwork and take photos, and runs in a circuit starting and ending at Shoreditch Overground Station. 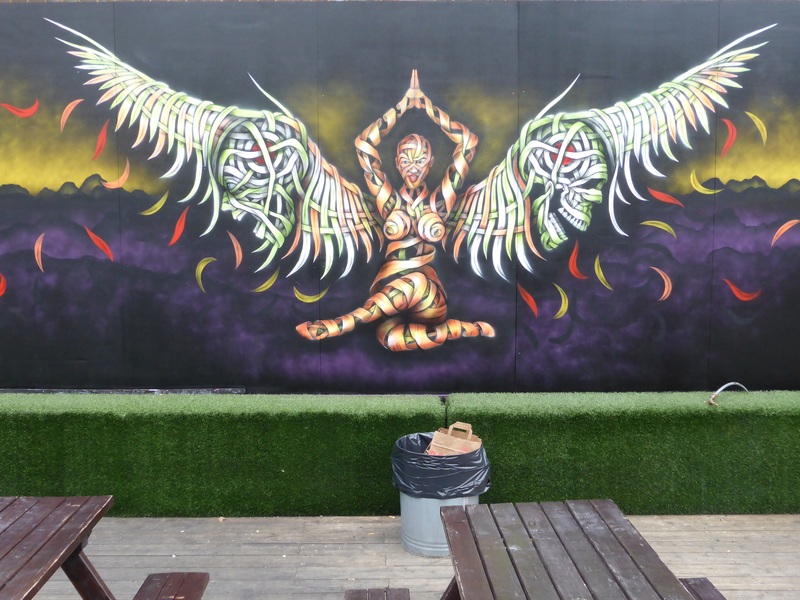 1: Upon exiting Shoreditch Overground Station turn right and pass through the train arches and you will be met by a series of paste-ups and feature walls including works from Lilly Lou & Gary MSK, Jim Vision and Candie at current. 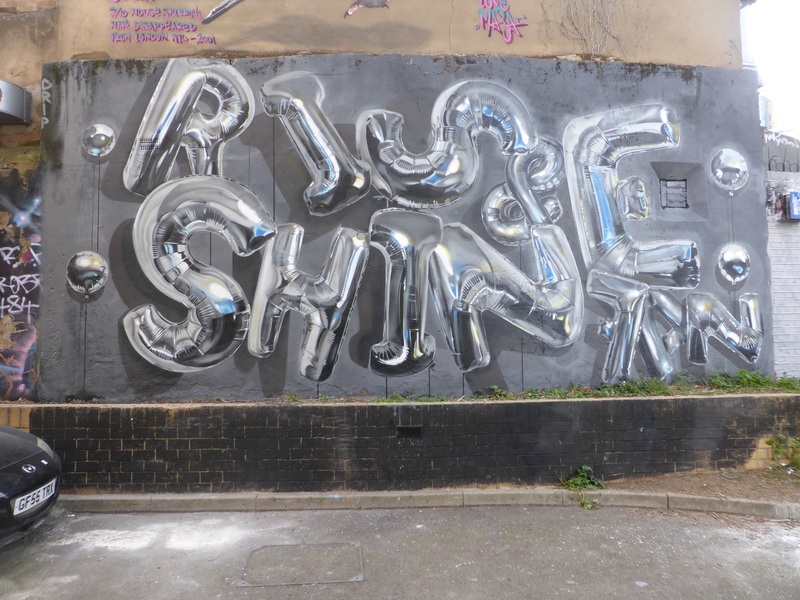 Typography work from Lilly Lou & Gary MSK on Braithwaite Street. 2: Follow the street to the main road and turn left onto Commercial Street and walk along until you meet with Fashion Street on your left-hand side. 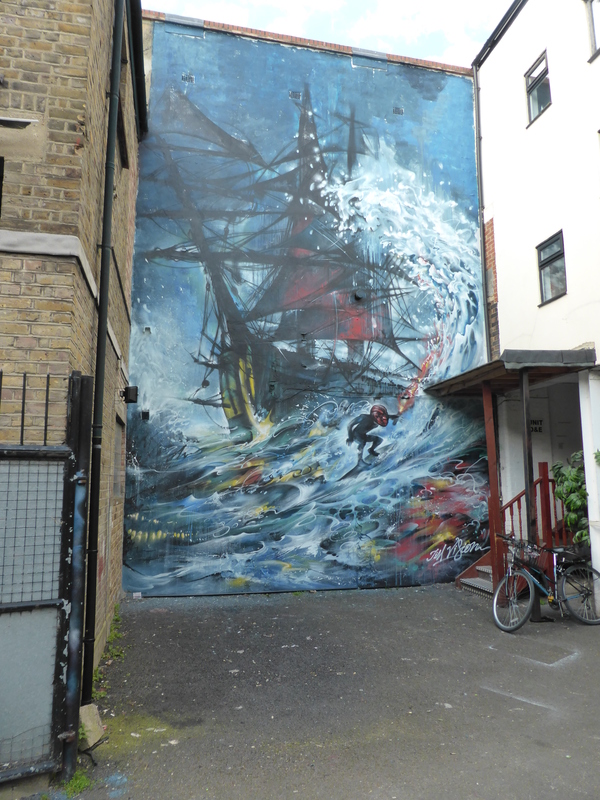 This street will take you into the bottom of Brick Lane and is home to many lovely artworks at current, including pieces from Conor Harrington, Otto Schade, Mr Cenz, Hunto & Jimmy C.
Works from Conor Harrington, Otto Schade & Ronzo in Fashion Street. 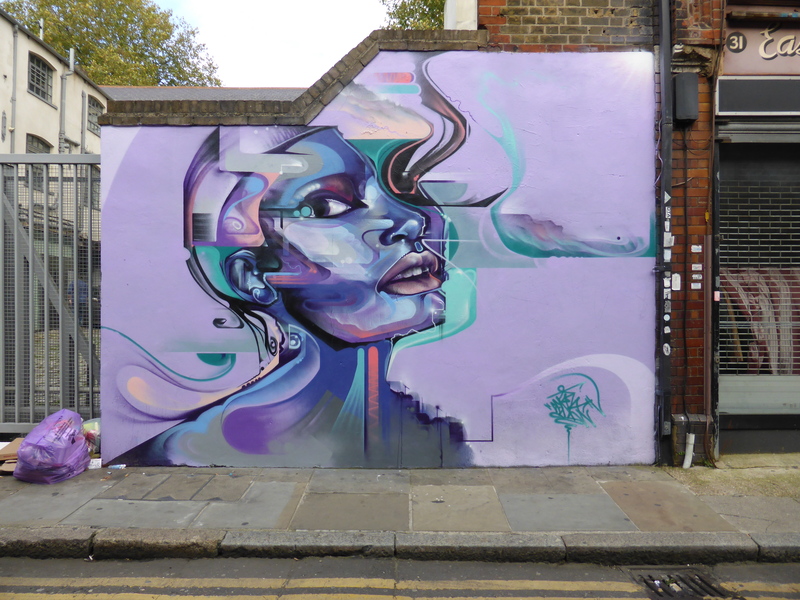 Mr Cenz work on Fashion Street. Jimmy C work on Fashion Street. 3: When you reach the end of Fashion Street turn left onto Brick Lane and walk along until you meet Heneage Street on your right-hand side. 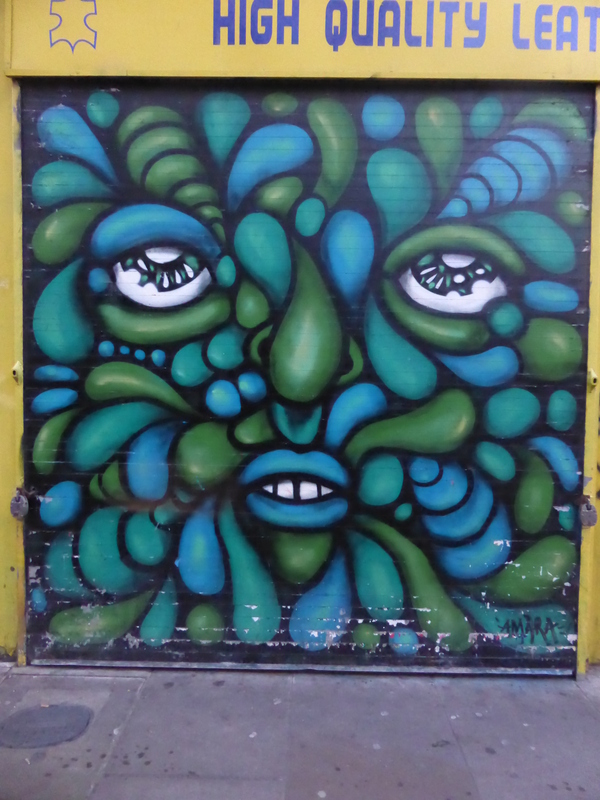 Along this street there are seveal gems to be seen including works from Bailon, Phlegm, Jim Vision and Hunto. 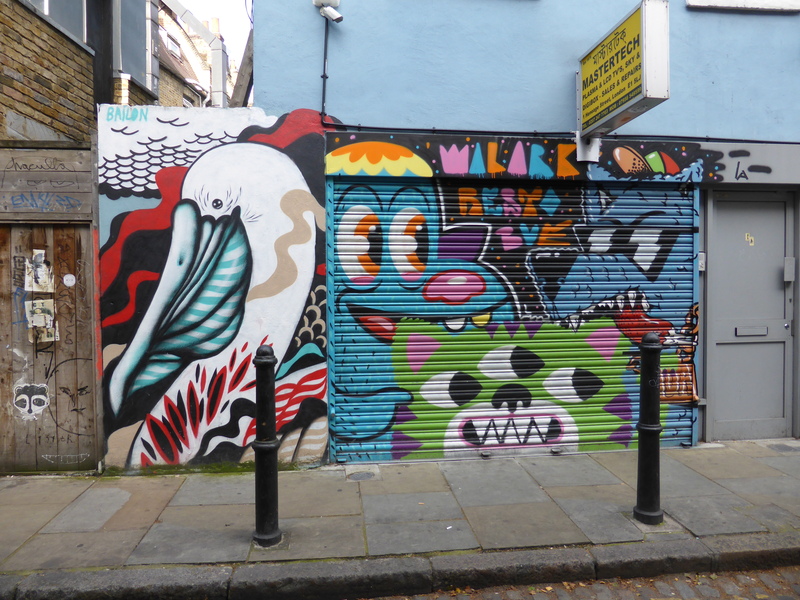 Work from Bailon (left) & Malarky (Right) on Heneage Street. 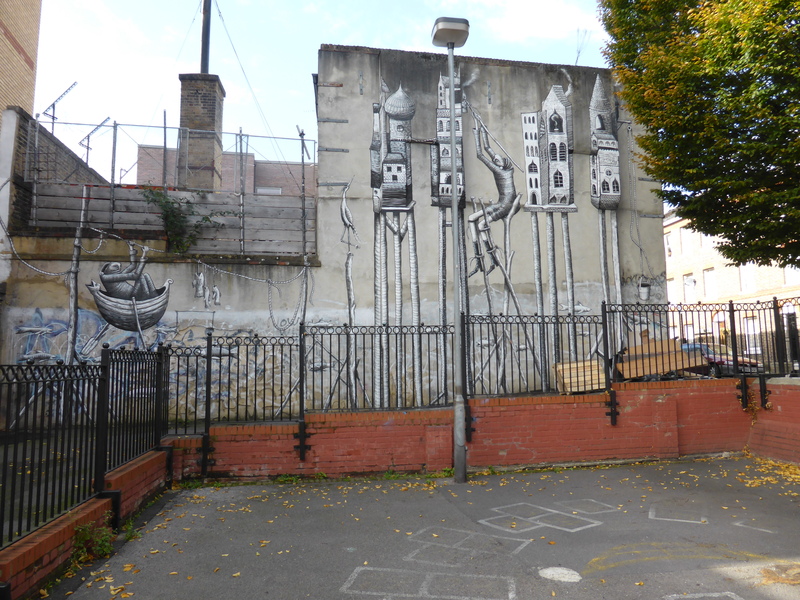 Work from Phlegm on Heneage Street. 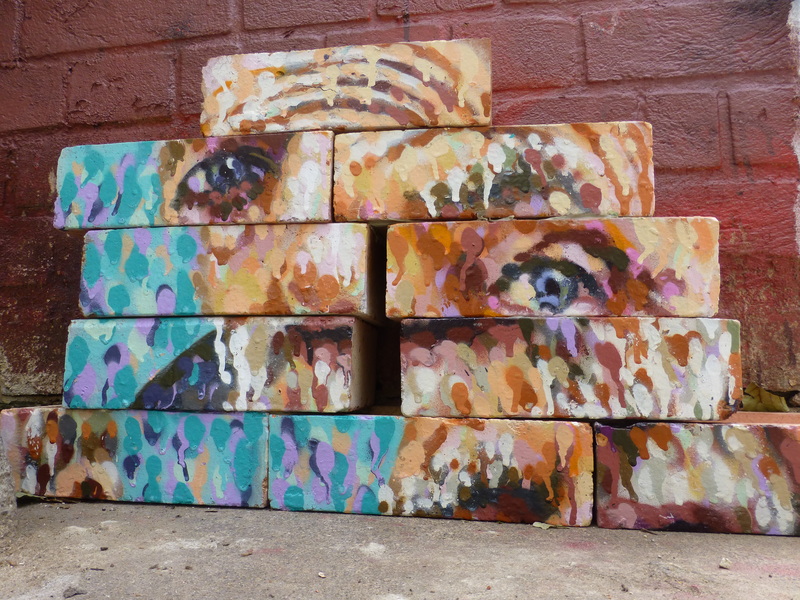 Work from Jim Vision in Huguenot Court. 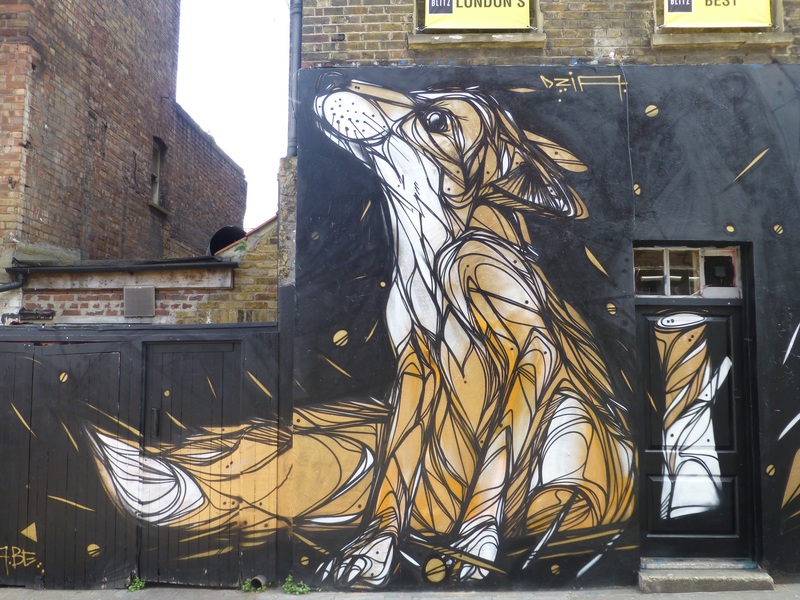 4: When finished in Heneage Street turn back and head back onto Brick Lane and turn right and walk along until you reach a little alleyway on your left-hand side which will take you into the Star Yard car park, one of the best spots for Street Art in the area, with a very high turnover of content. 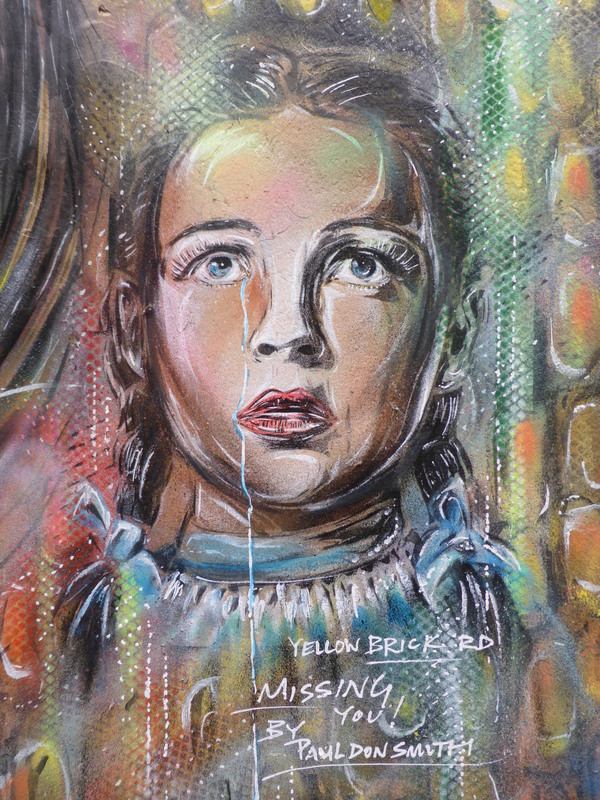 Work from C215 on Brick Lane. One of countless Noriaki works in the area, in Star Yard. Shutter work from Milo Tchais in Star Yard. Jimmy C work in Star Yard. Fanakapan work in Star Yard. Mr Cenz work in Star Yard. 5: When finished in Star Yard, head back out onto Brick Lane and turn left. As you head along Brick Lane when you meet the corner of Fournier Street this work below from Shok-1 can be seen, after this carry on along Brick Lane until you reach the next road on your left, Princelet Street and here you will be met by works from Stik & Otto Schade. 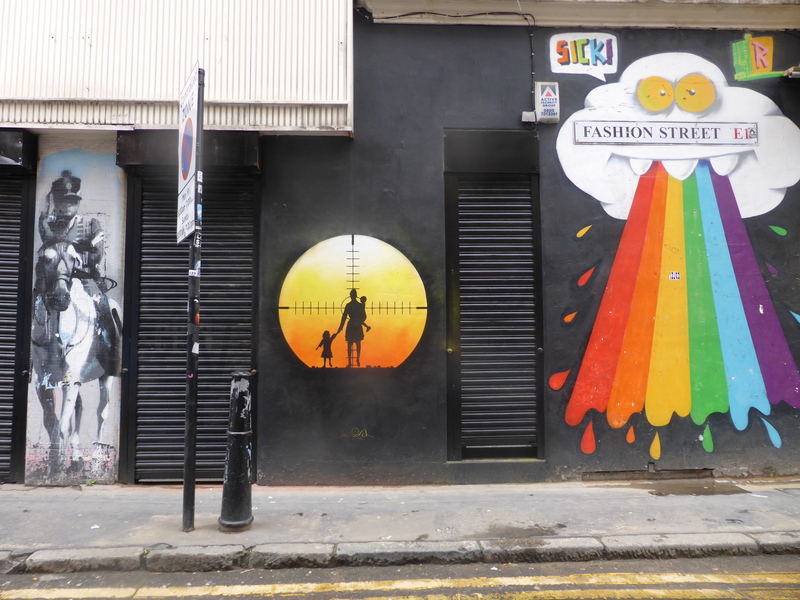 Work from Shok-1 in Fournier Street. 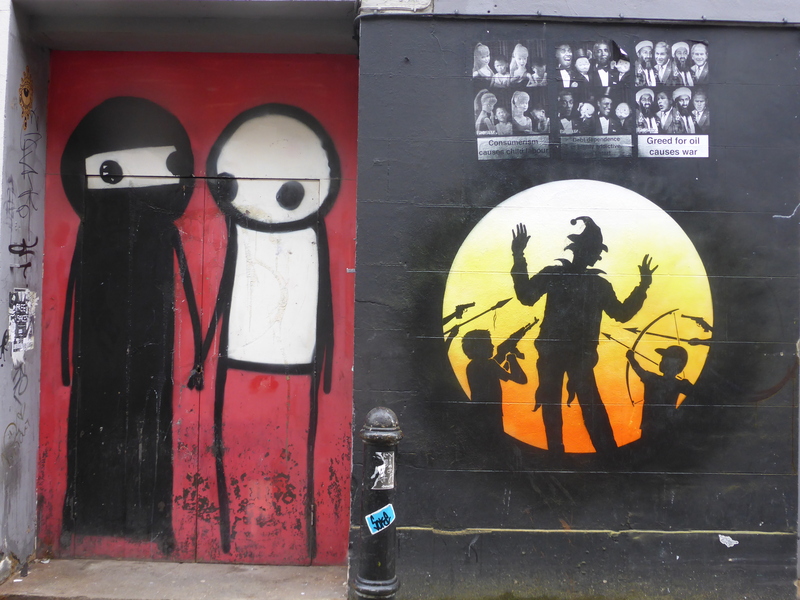 Works from Stik & Otto Schade in Princelett Street. 6: When done in Princelet Street head back the way you came and turn left up Brick Lane until you reach Hanbury Street, most certainly one of the stand out locations for Street Art in the area, and London for that matter, a street that often attracts the crème de la crème of artists, with works from Borondo, ROA, Jimmy C, Bailon & Sliks currently to be seen. 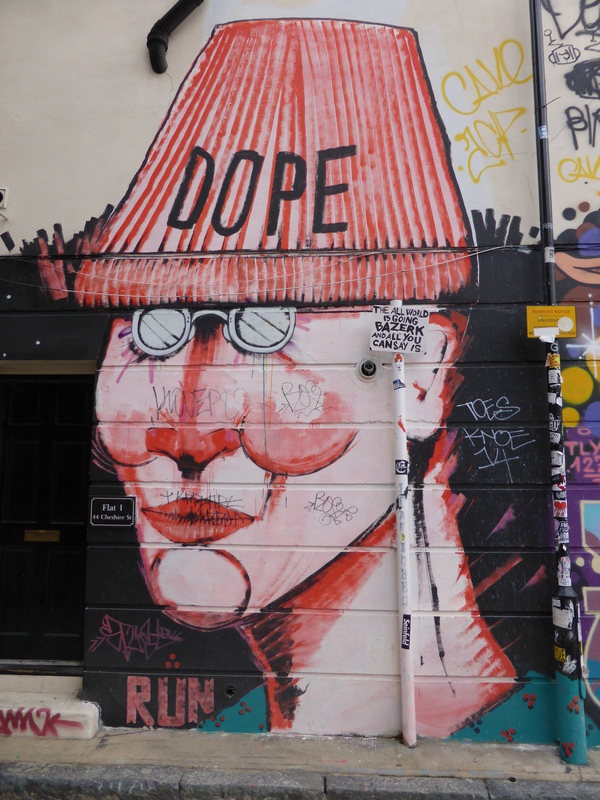 As you reach Hanbury Street head left to see some interesting pieces but it is the right-hand side of the street that is just packed with high quality Street Art. 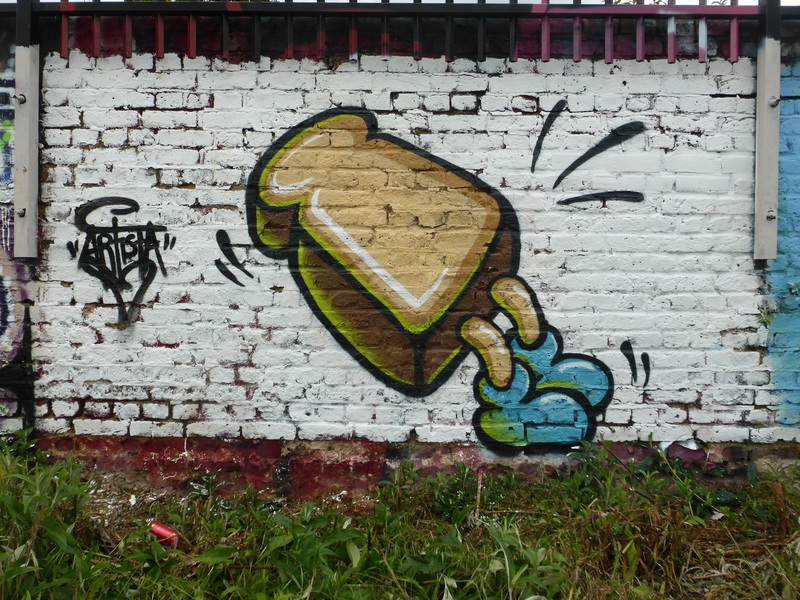 Work from DZIA in Hanbury Street. 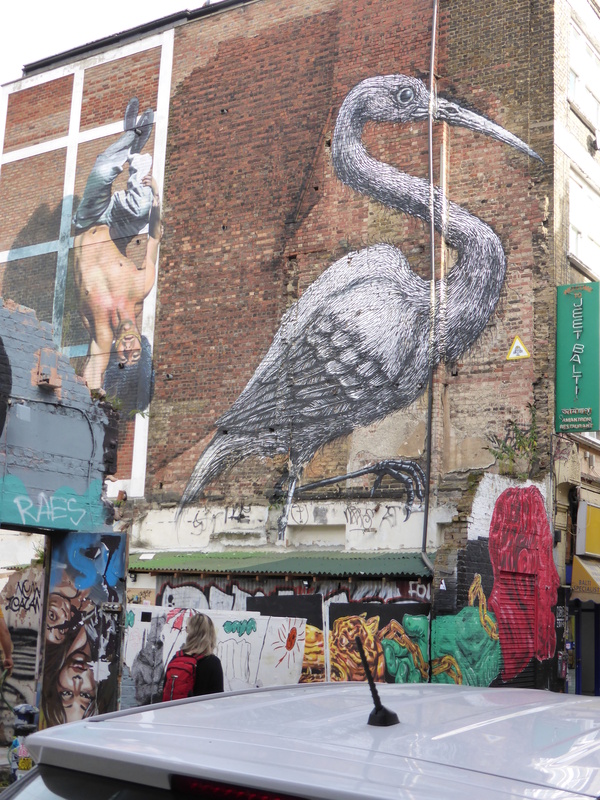 Work from ROA in Hanbury Street, which has been there since 2010 and is stlll going strong, work from NDA below it. 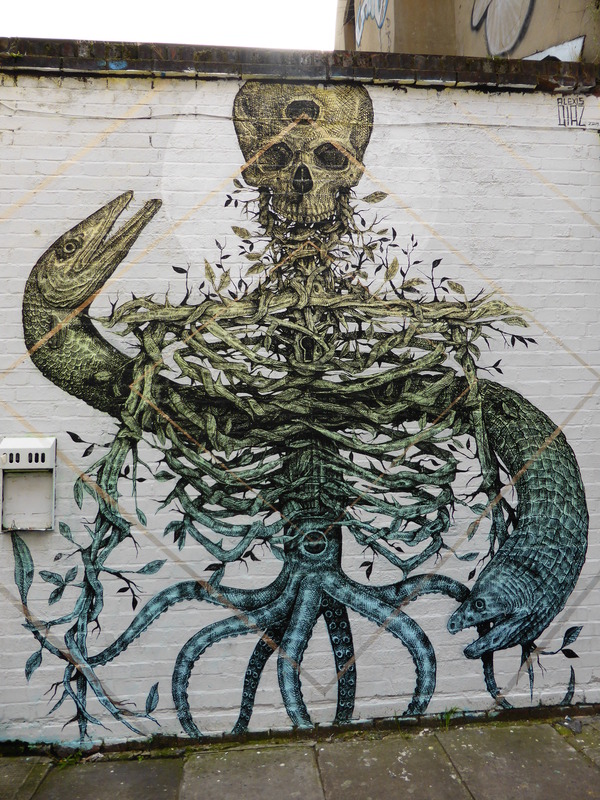 Work from Borondo in Hanbury Street. 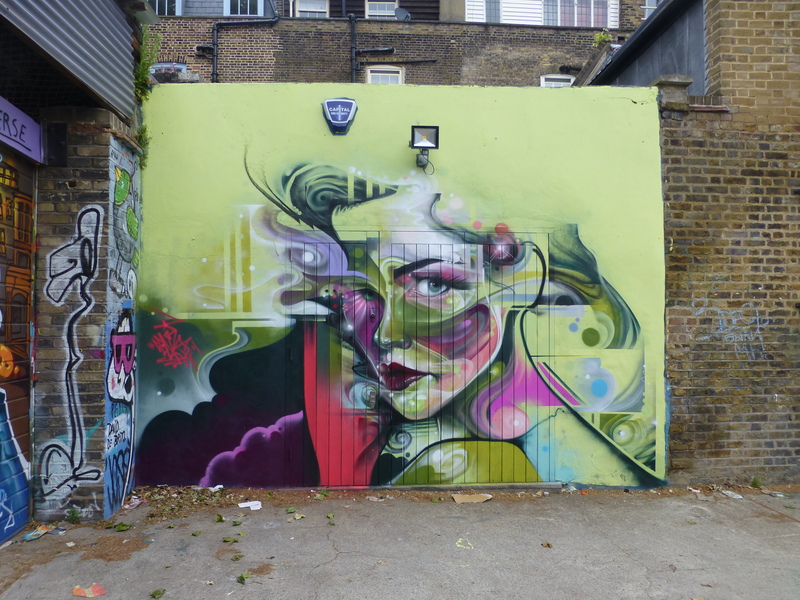 Collaboration from Sliks, Bailon & Jimmy C in Hanbury Street. 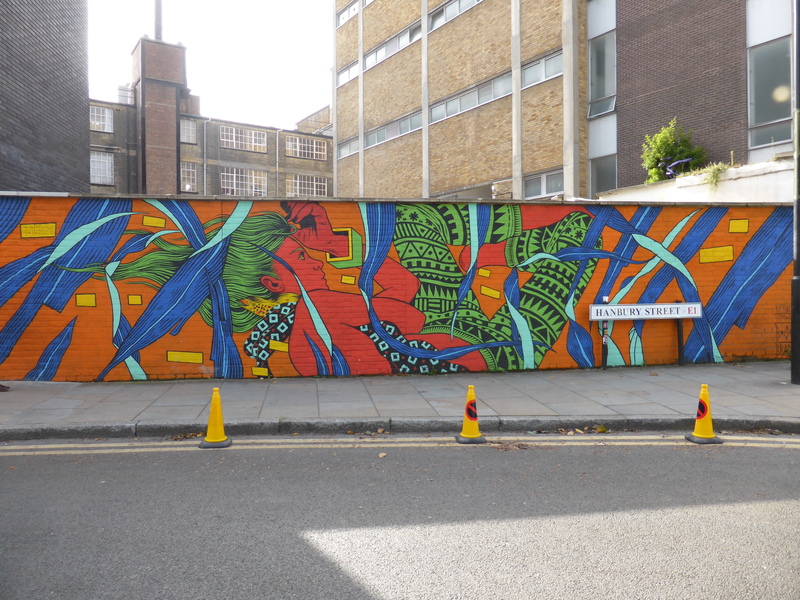 Work from Bicicleta Sem Freio in Hanbury Street. 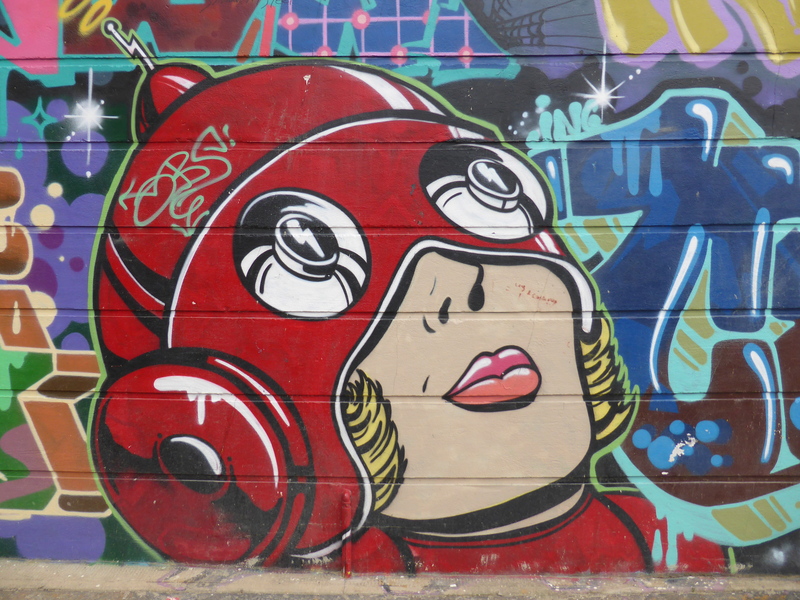 7: When done in Hanbury Street head back to Brick Lane and turn right until you reach on your left-hand side the Truman Brewery which has many spots with a regular turn over worth checking out, including currently works from Otto Schade, DZIA, Invader & Shepard Fairey to be seen. 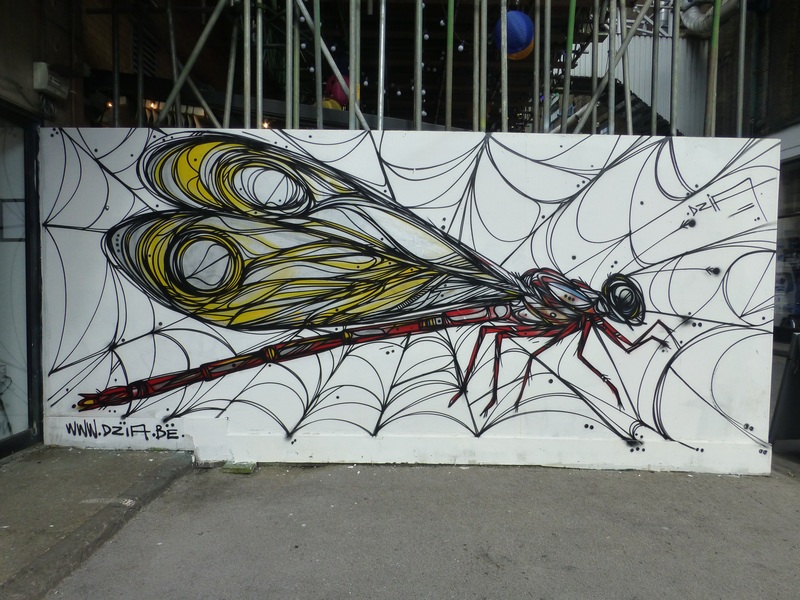 Work from DZIA in the Truman Brewery. 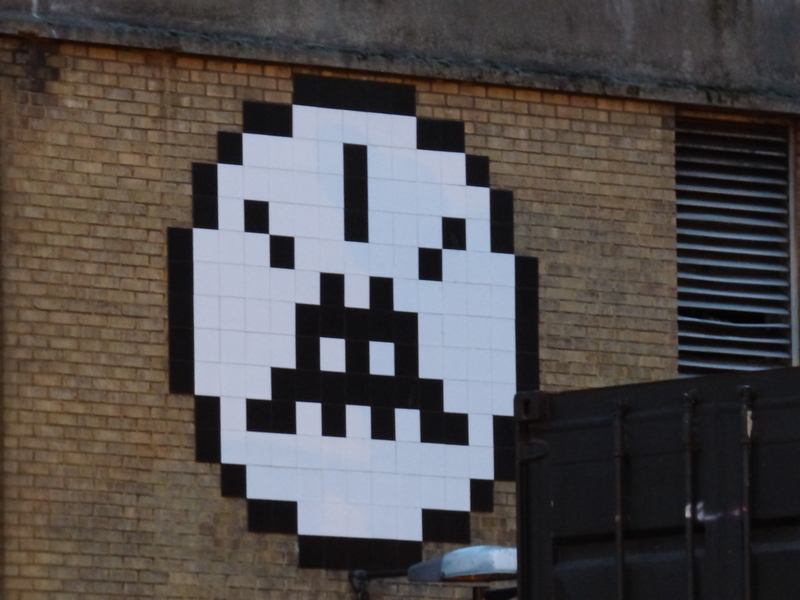 Work from Invader in the Truman Brewery. 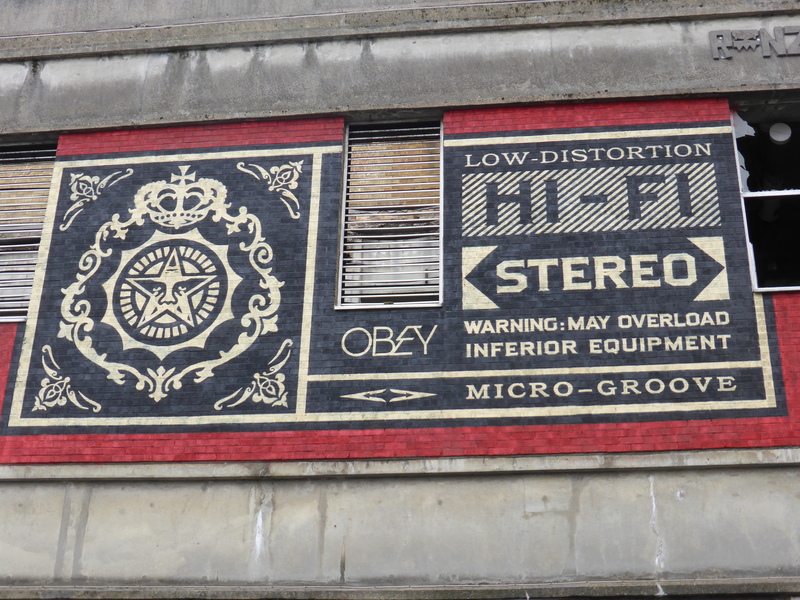 Work from Shepard Fairey in the Truman Brewery. 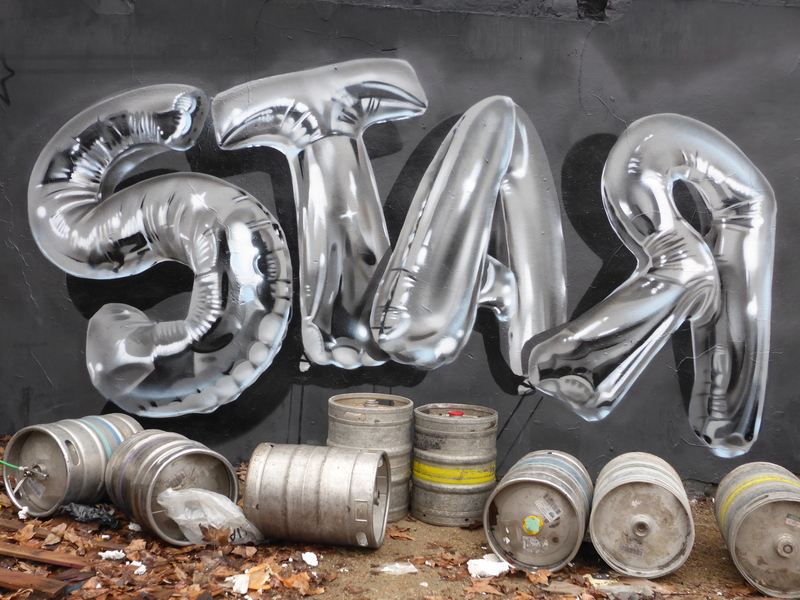 Work from Otto Schade in the Truman Brewery. 8: When finished in the Truman Brewery come back out the way you entered, onto Brick Lane and turn left until the next junction with Quaker Street on your left and Buxton Street on your right-hand side, both of these streets are worth exploring, especially the first section of Buxton Street with a large work from James Earley and several Paul ‘Don’ Smith works currently on display. 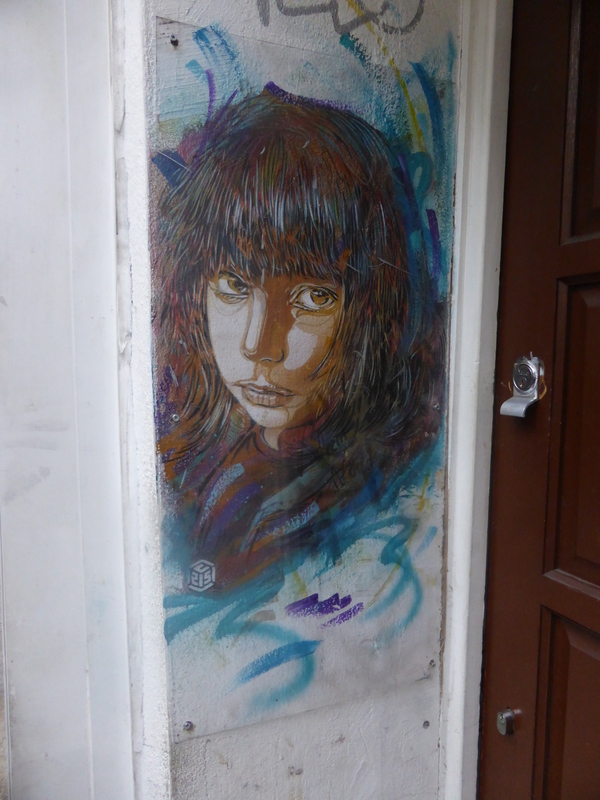 Work from James Earley in Buxton Street. 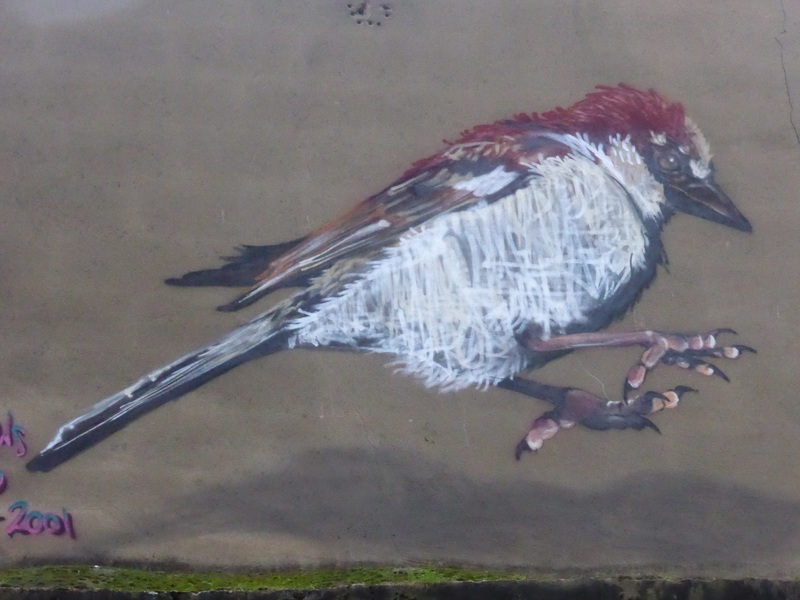 Work from Paul ‘Don’ Smith in Buxton Street, where he currently has some 7 pieces on this pub wall. 9: At this point carry on back along Brick Lane until you reach the tiny alleyway on your right-hand side, this is Pedley Street and this tiny stretch always has some great Street Art to be seen with works from Cranio, Fanakapan, Louis Masai & a superb collaboration from Jim Vision & Zadok to currently be seen. 1 of 4 Clet Abraham works along Brick Lane. 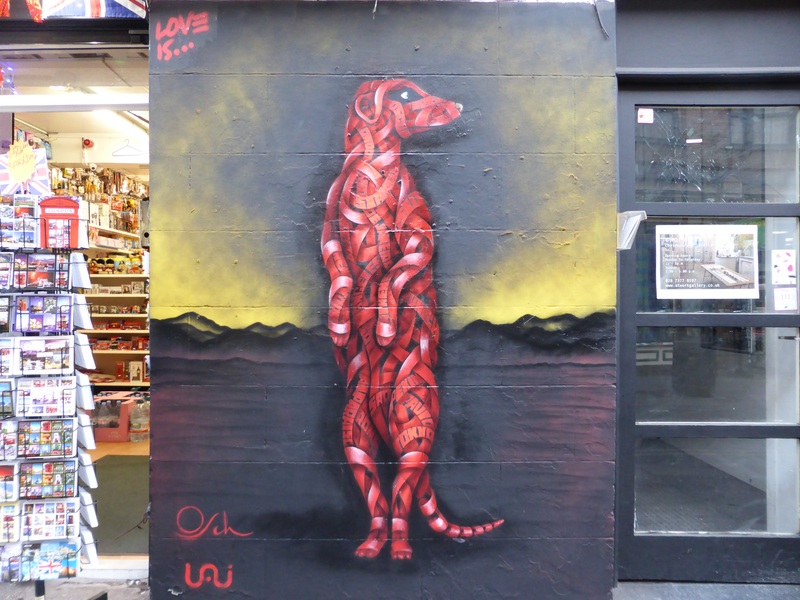 Be sure to keep an eye peeled for these works from Gregos, he has several along the course of this walk, including this piece on the corner of Quaker Street & Brick Lane. Meerkat from Otto Schade on Brick Lane. 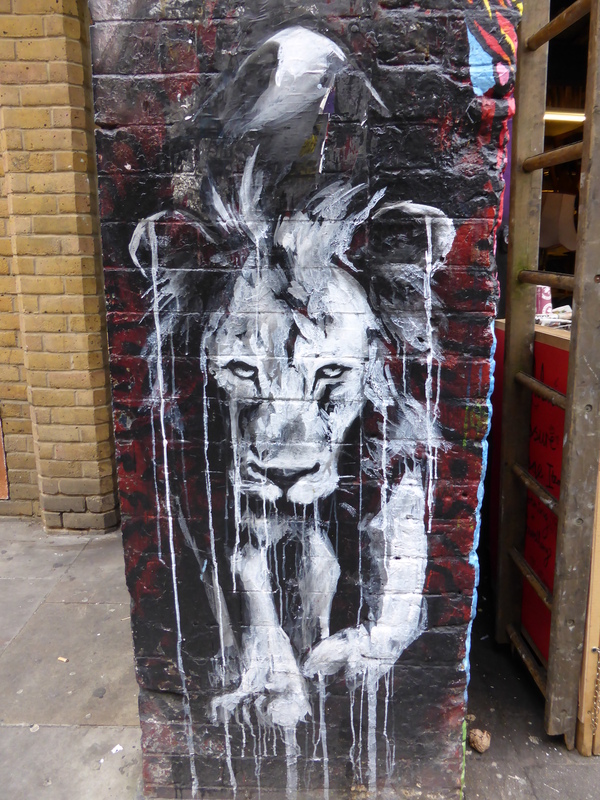 Superb stalking Lion from Faith47 on Brick Lane. Work from Fanakapan on Brick Lane. 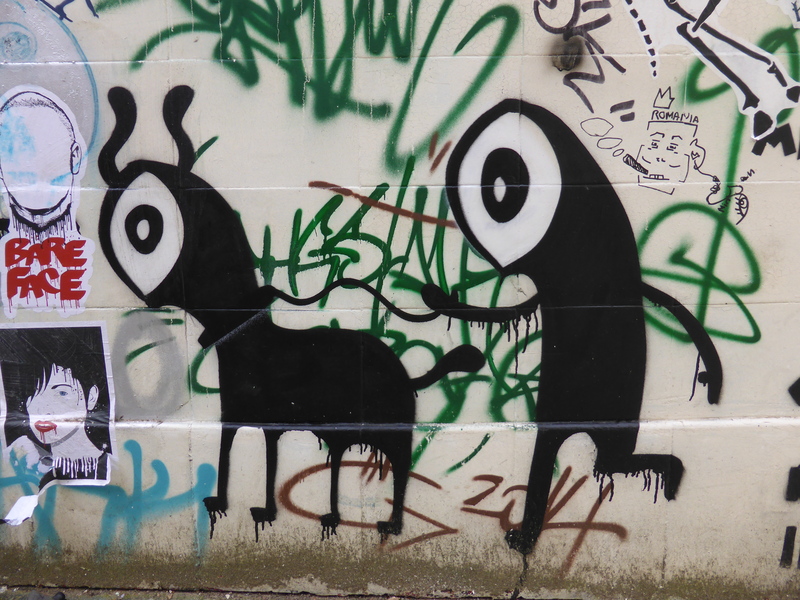 Work from Cranio currently resides on the Kinkao restaurant wall, a key spot that features the best of artists. 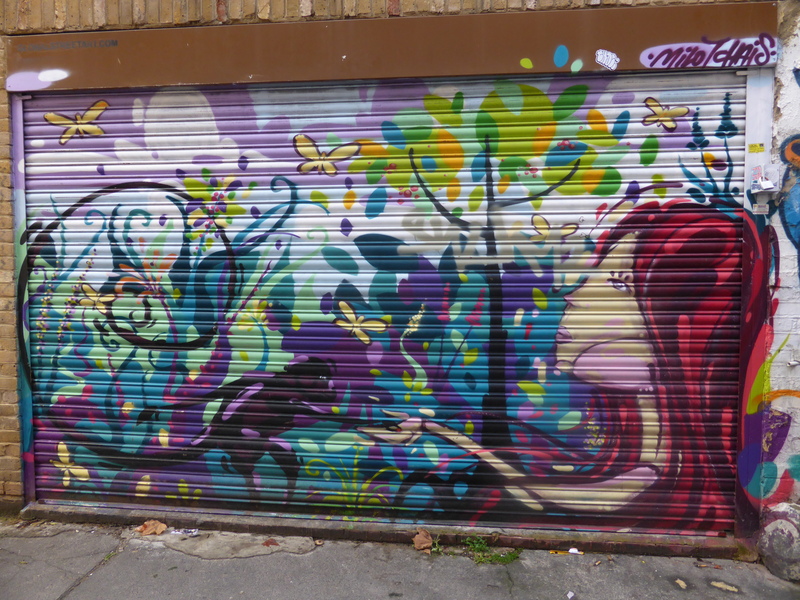 Work from Fanakapan in Pedley Street. 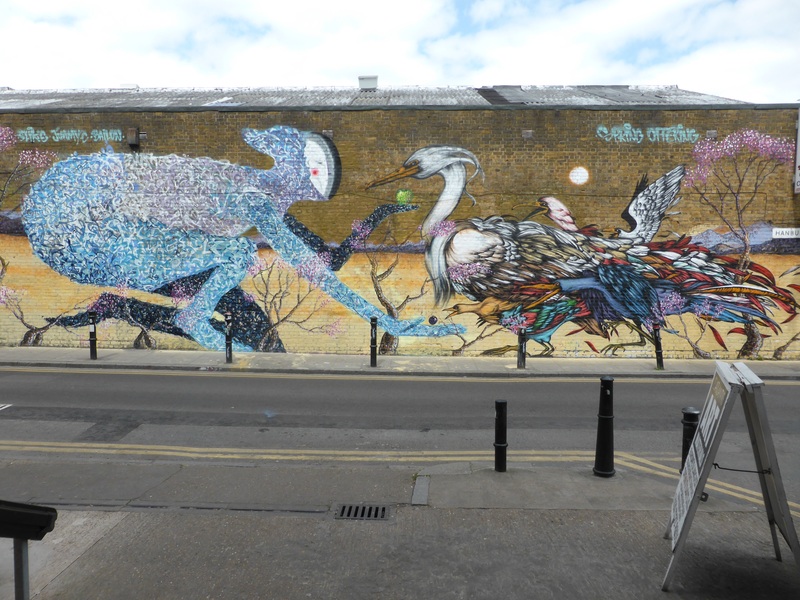 Work from Louis Masai in Pedley Street. 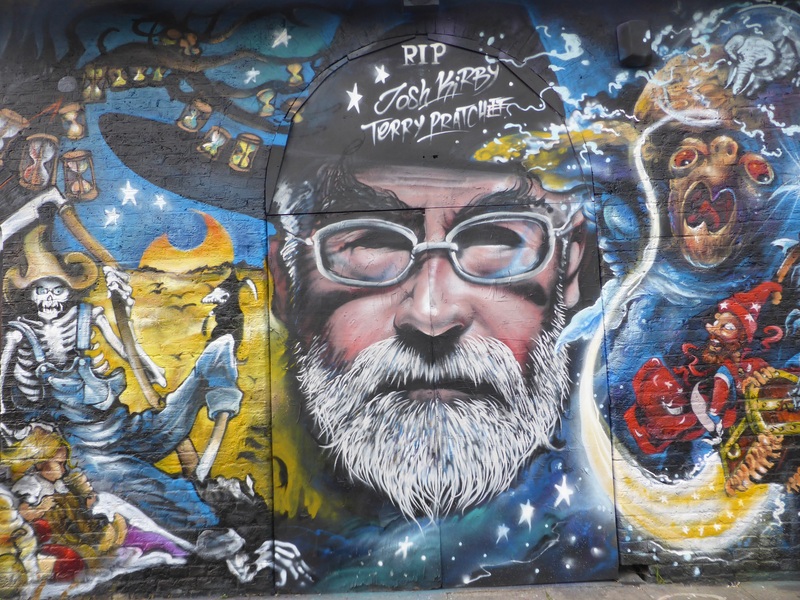 Superb collaboration work from Jim Vision & Zadok, a tribute to the late Terry Pratchett & Josh Kirby. 10: When done in Pedley Street head back the way you came and turn right back onto Brick Lane once again until you reach Grimsby Street on your right-hand side and head along this road until it loops around to Cheshire Street and head left back towards Brick Lane taking the high number of art pieces to be seen along the way. 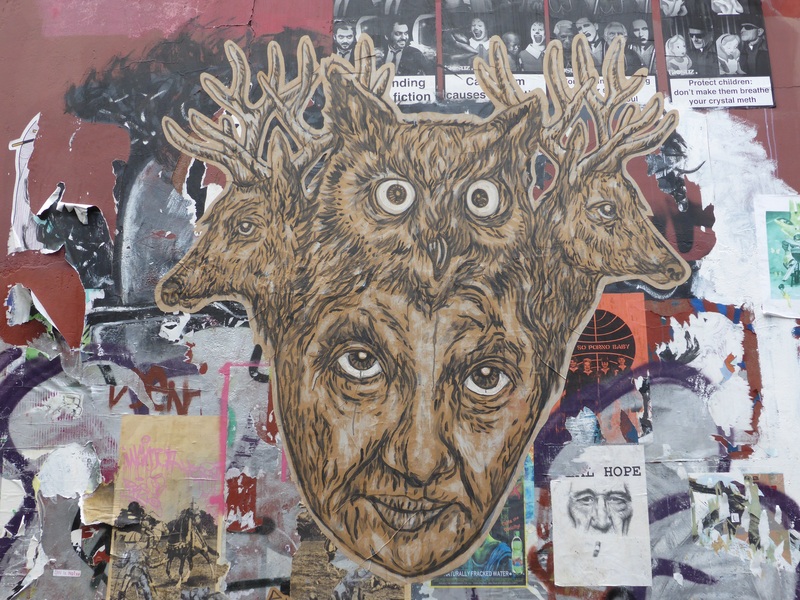 This spot on Grimsby Street is popular with paste-ups including this great hand painted work from Pyramid Oracle. 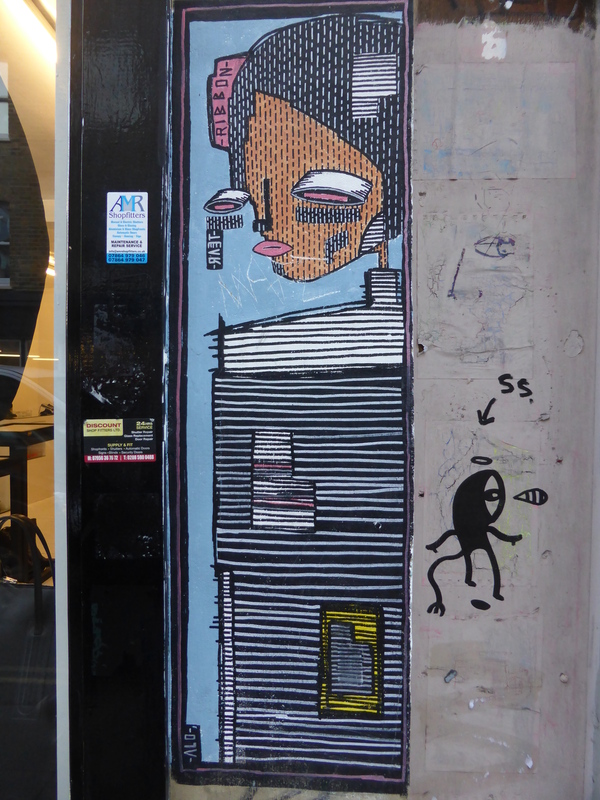 Delightful work from Stik in Grimsby Street. 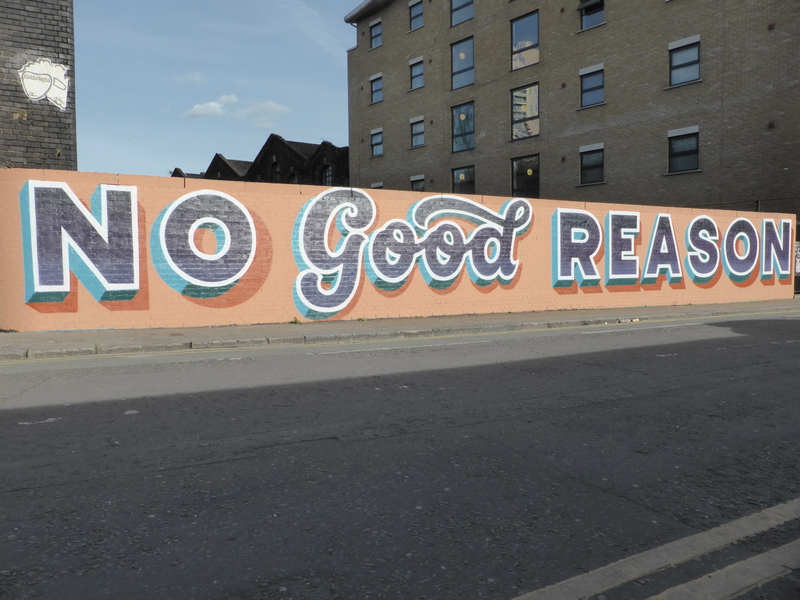 Work from Cept in Grimsby Street. 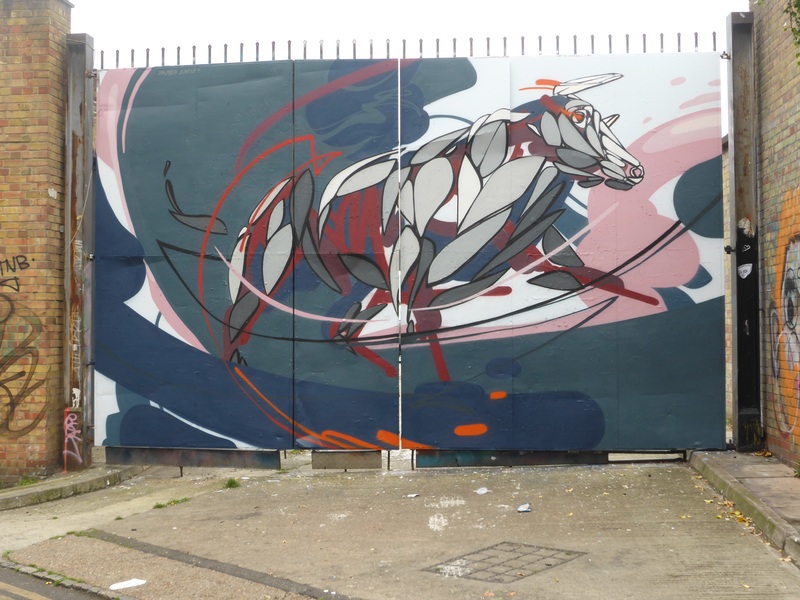 Work from Run, in Grimsby Street, his only piece in the area. 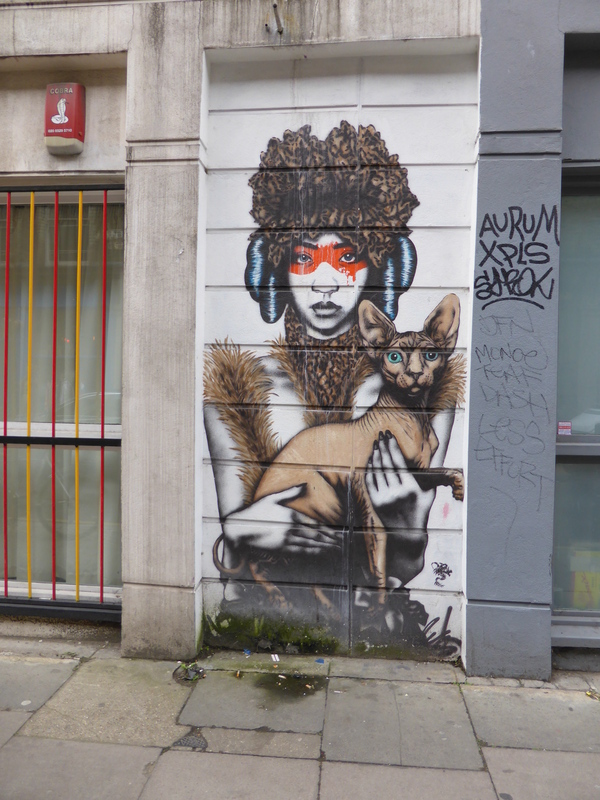 Work from Findac in Cheshire Street. The only one we know of currently to be seen in London. 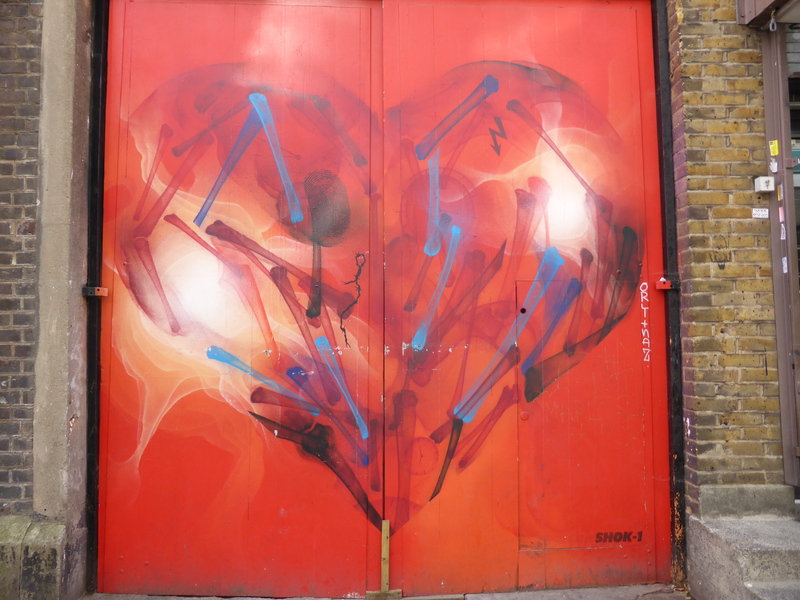 11: When you hit Brick Lane from Cheshire Street turn right and take in the many artworks along the main road, including spots such as Monty’s Bar and the Brick Lane Gallery, and head along in the evening ideally in order to catch all the works placed up on the shutters of the residing businesses. 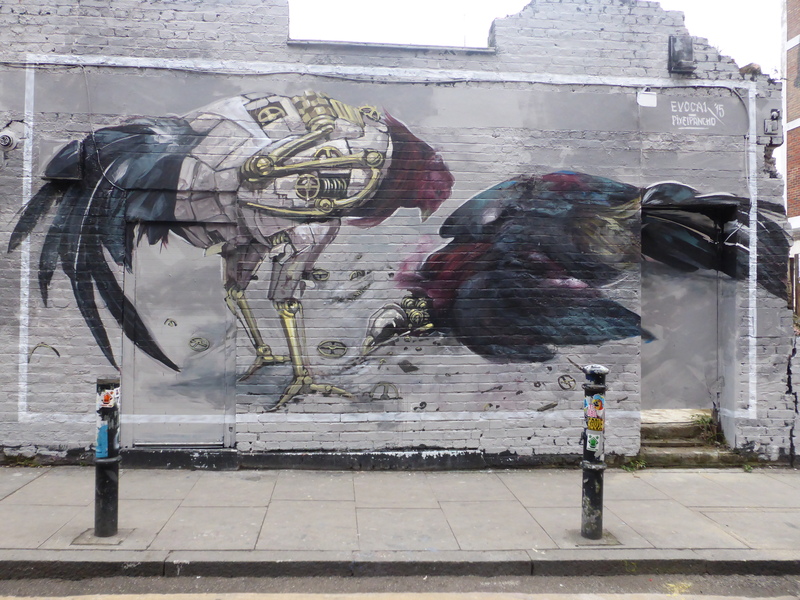 One of several works from Zabou along Brick Lane. Shutter work from Amara Por Dios, like many of the works on shutters, you need to catch these before or after business hours. 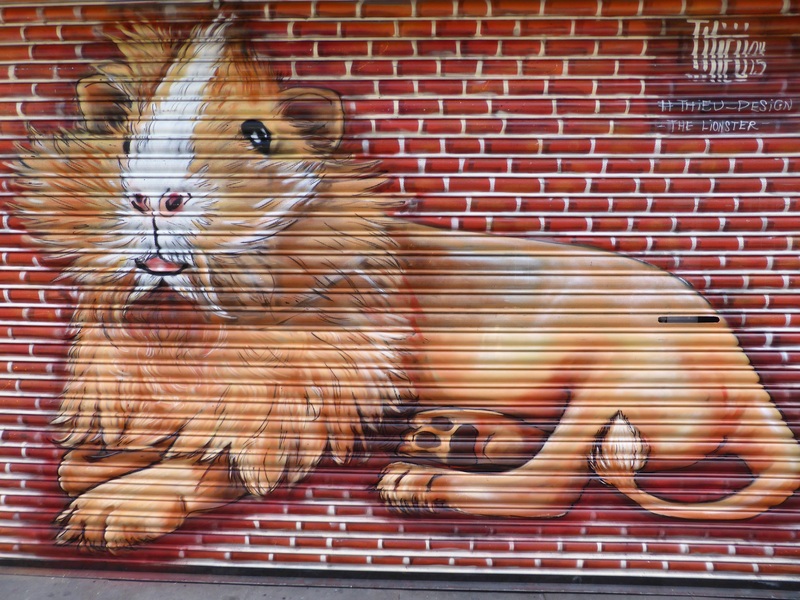 Superb work from Thieu featuring her very own ‘Lionster’ on Brick Lane. 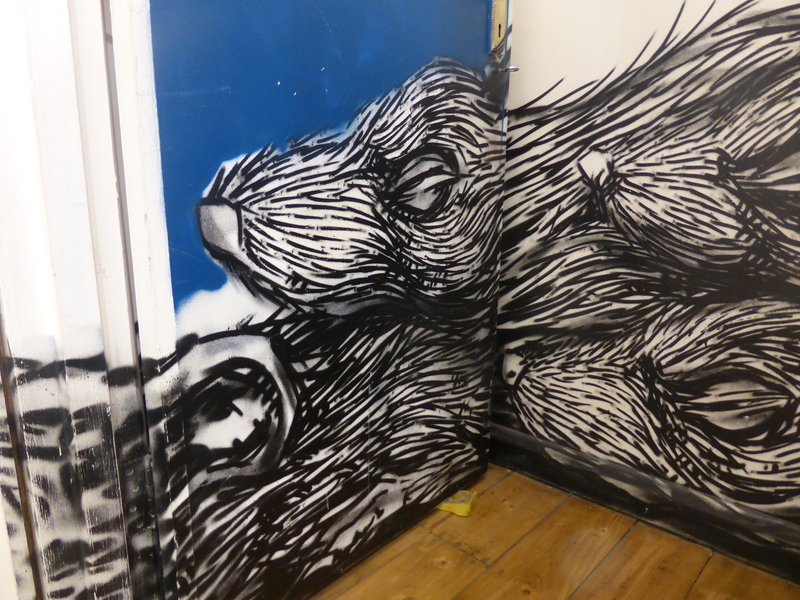 Work from ROA on the stairwell of the Brick Lane Gallery. 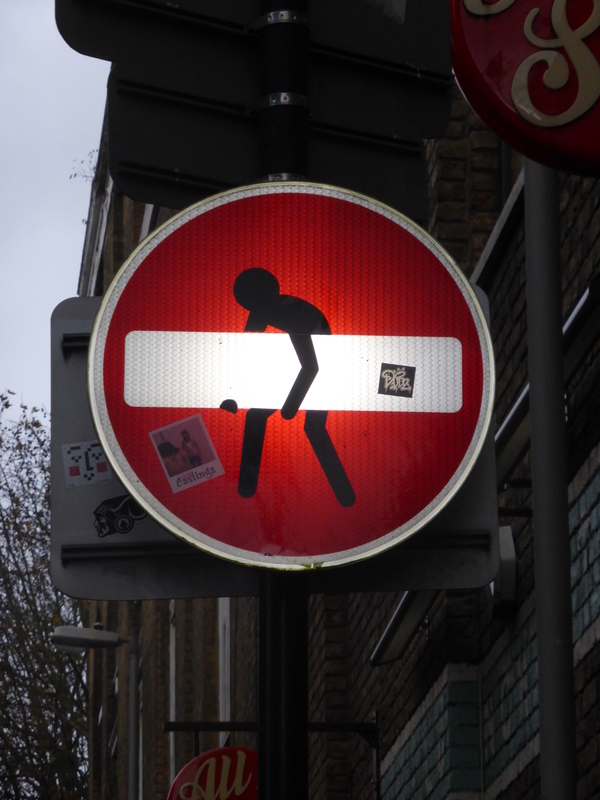 Work from ALO & Noriaki in Brick Lane. 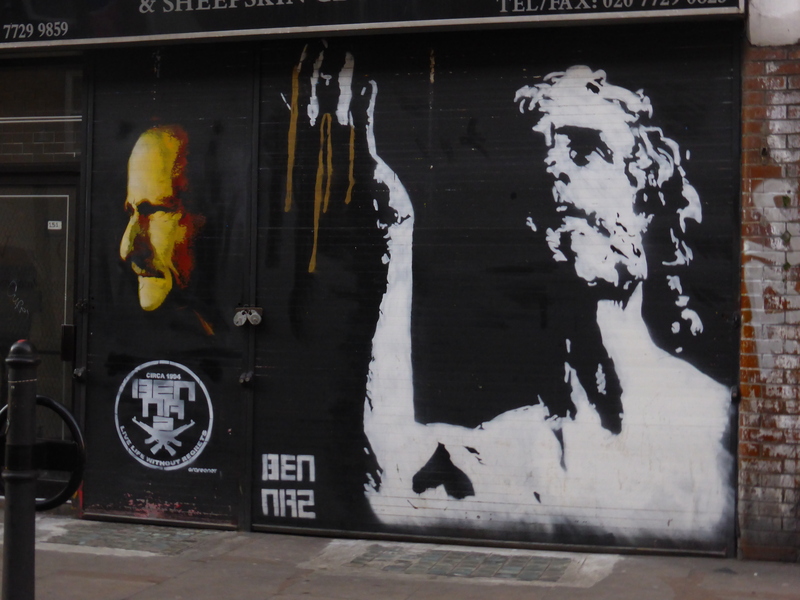 Pair of Stencil works from Graffeeney and Ben Naz on Brick Lane. 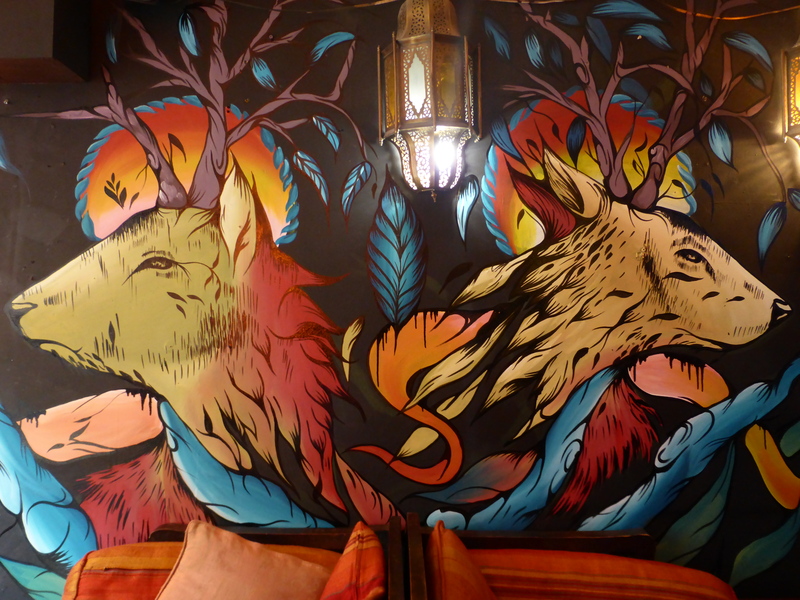 Work from Fio Silva in Monty’s Bar, there’s several more great works on the walls to be seen. 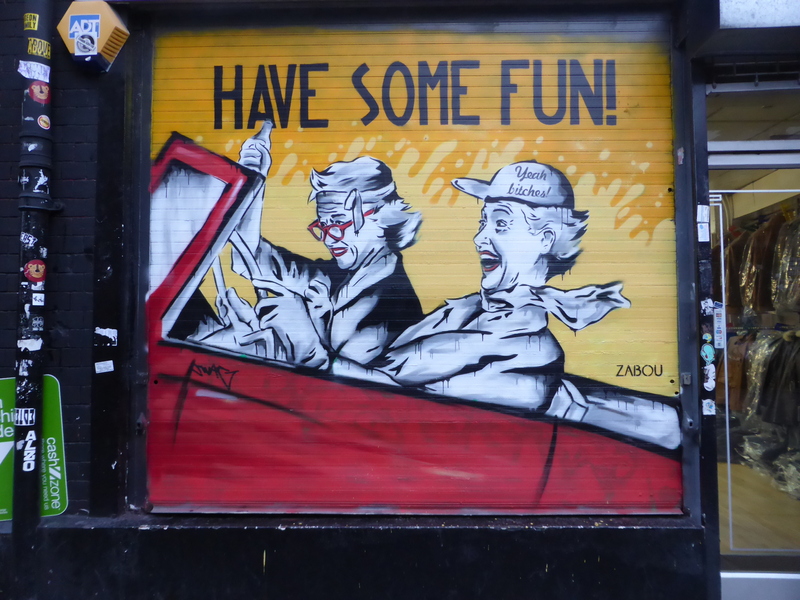 12: When you reach the main drag of Bethnal Green Road, turn back along Brick Lane until you reach Bacon Street on your right-hand side for the final two legs of the tour. 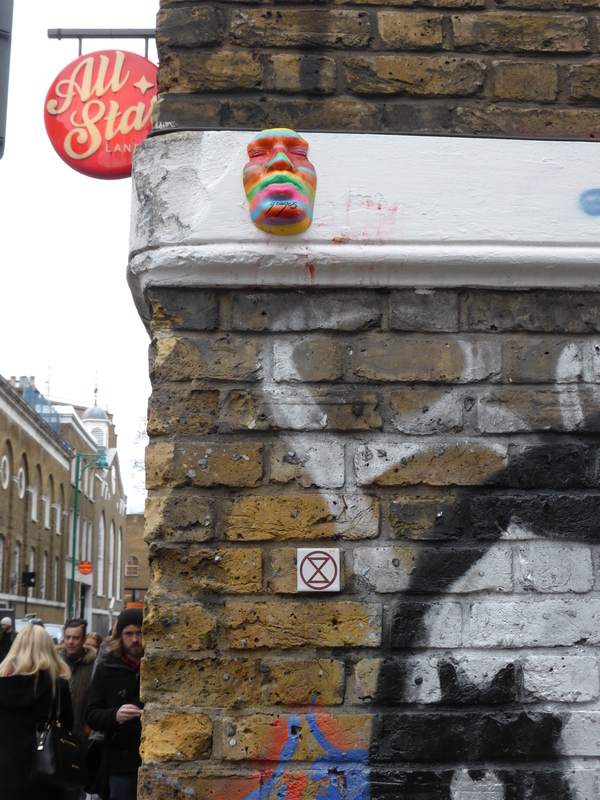 On this tiny street you can see superb works from Ben Slow, Alexis Diaz and ROA. 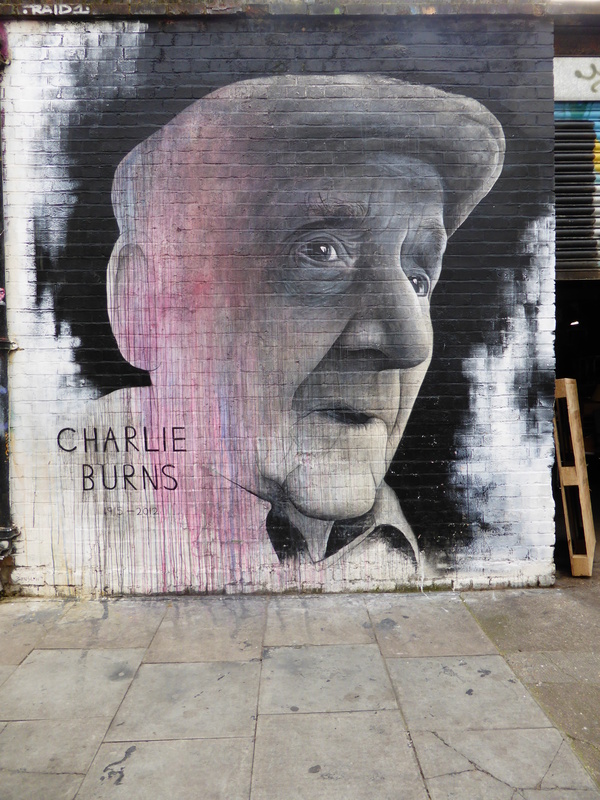 Work from Ben Slow in Bacon Street, a tribute to former local resident Charlie Burns. 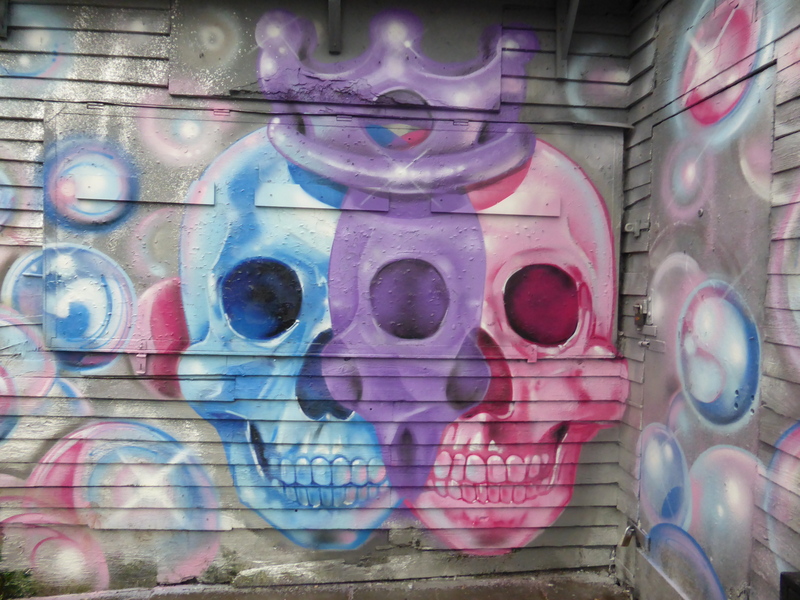 Work from Alexis Diaz in Bacon Street. 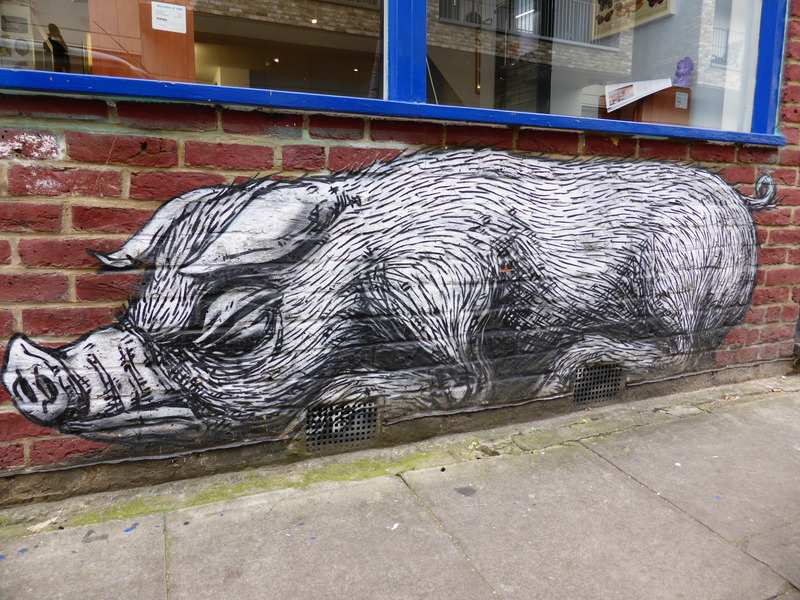 Work from ROA in Bacon Street. 13: As you reach the end of Bacon Street follow the road around into Cygnet Street head into Scalter Street, the final stop on this walk. 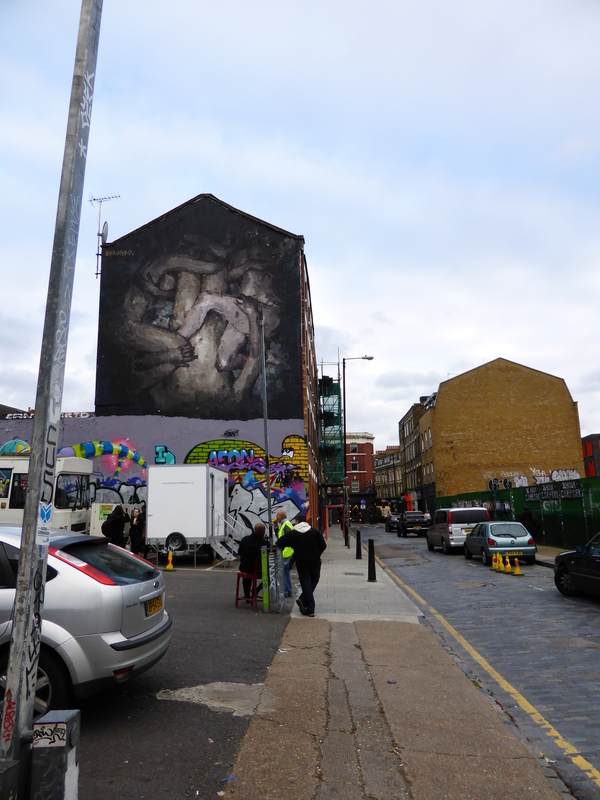 As you hit Sclater Street turn right and follow along until you find yourself back at Shoreditch Overground Station completing the walk, taking in the works on the feature walls. 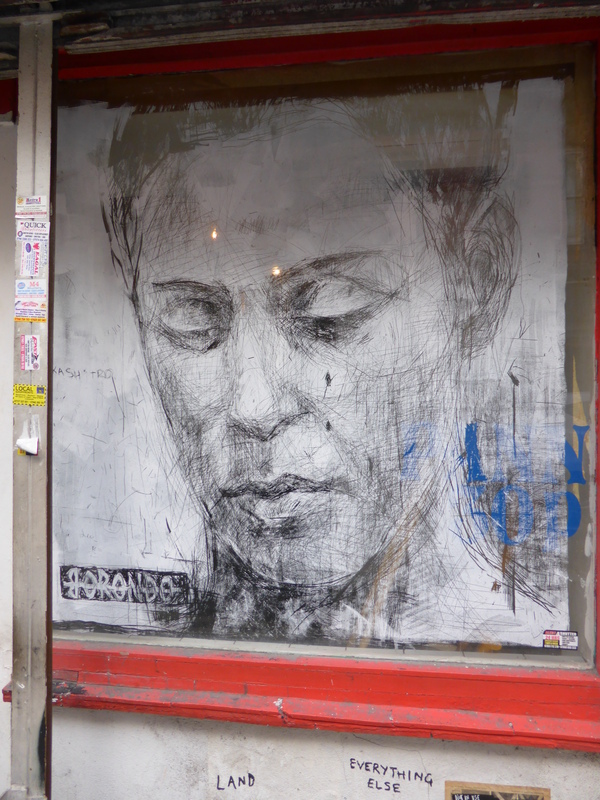 Large-scale work from Borondo in Sclater Street. 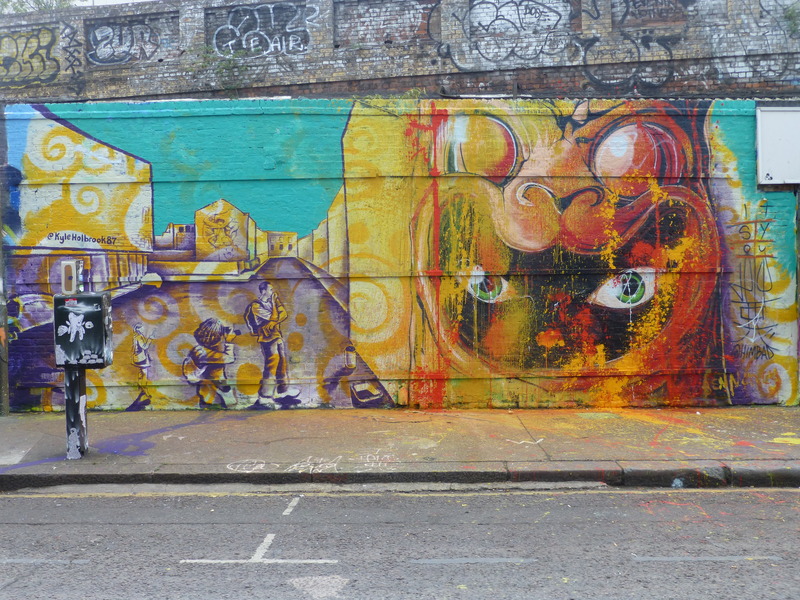 Work from Stinkfish in Sclater Street. 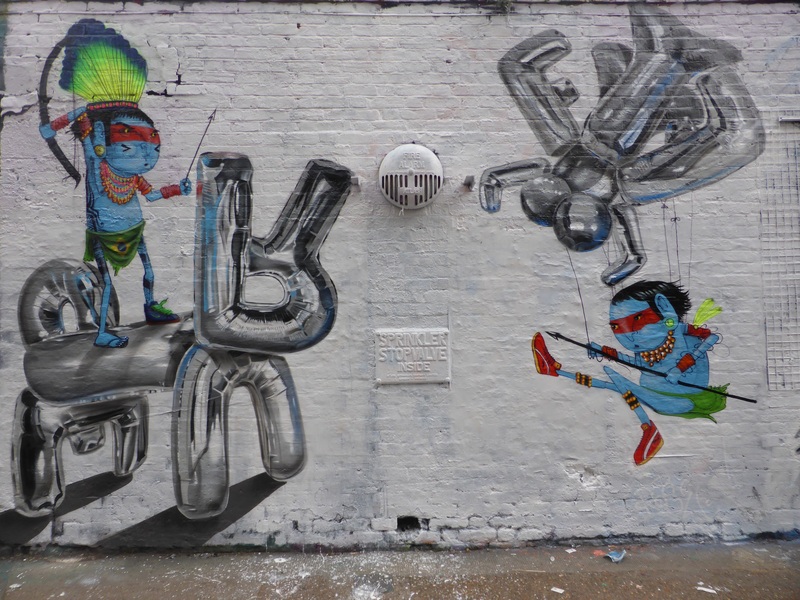 Superb collaboration from Fanakapan & Cranio in Sclater Street. 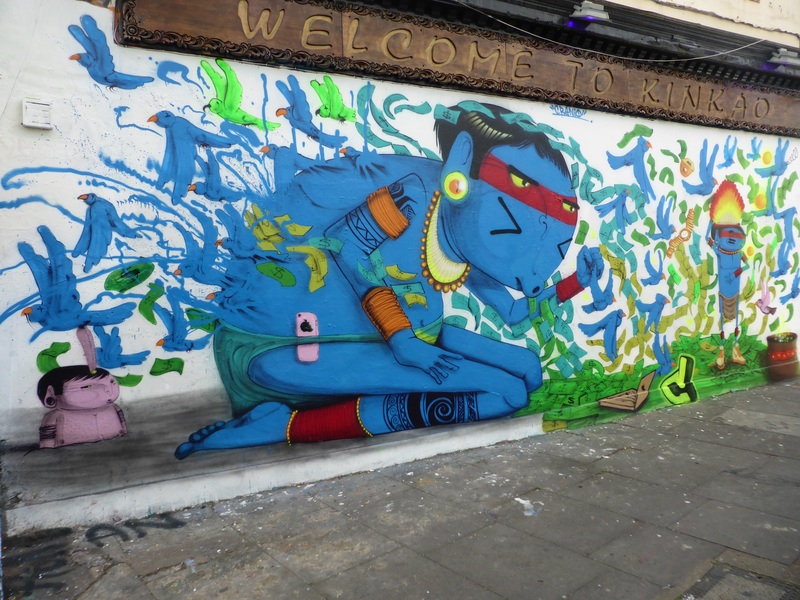 Another Superb collaboration this time from Kyle Holbrook & Himbad in Sclater Street. You extraordinary humans who see the world with a different eye… an eye who makes others slip out their comfort zone and awaken to thoughts and feelings we never believed we could ever experience! Heading to London at the weekend – this is brilliant!!! !